Stunned … you hang up the phone. Your client wants to meet face-to-face. You work-at-home, and your house is a wreck. Scenarios like this happen to home-based workers all the time. 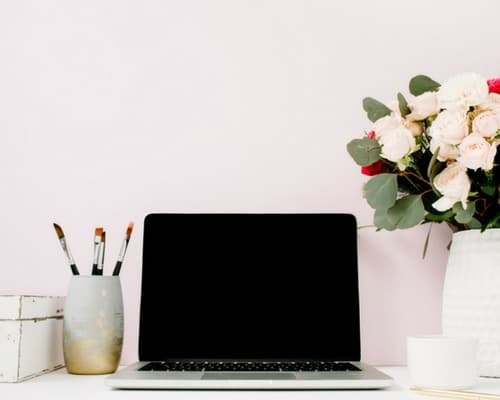 Sometimes you can avoid home meetings by scheduling your appointments at a coffee shop or co-office space, but sometimes the home meeting is unavoidable. If you find yourself having to meet a client at home, here are ten quick cleaning tips to make the best first impression. Walk up to your door while looking through the eyes of your client. Notice what areas look the worst and tackle them first. Spend the most time and effort cleaning up areas that will provide the most noticeable improvement. Vacuuming your child's playroom can wait until later. Set time limits for your cleaning activities. When a task takes longer than the allotted time, consider moving on to something which can offer better results. The goal is to get the most productivity out of the limited time you have available. When peace rules at your home, take some time to organize your cleaning supplies. Make sure you know what you have and where you have it. Keep essential solvents and supplies in stock. This way when emergency strikes, you’re not forced to spend precious time looking around the house for tools and supplies or running out to the store to get the things you need. As a business person, you should have your business procedures defined, so you and your employees always have a document to reference when performing unfamiliar tasks. Do the same thing for cleaning. Have a cleaning procedure defined for emergencies and standard cleaning. This way you and your family will know exactly what needs to do when the crisis comes. Newspapers, books, pizza boxes, toys, mail, dirty clothes, and everyday junk piles up all around you every day. Because clutter is both ubiquitous and conspicuous, try attacking it first. And always try to purge unneeded items as you go. Some experts say that a pleasant aroma predisposes a person to positive feelings — even when they walk into a dump. Always keep a good smelling candle or scent warmer on hand and use as needed. If you will meet your visitor in the living room, clean that first. Clean the kitchen if that’s your best meeting spot. Again, by cleaning the most noticeable areas first, you will get the most benefit from your efforts. You hope that your guests won’t need to use your bathroom, but everyone needs to go from time to time, so prepare yourself. Once your meeting area is sorted, police the bathroom. Stowaway potentially embarrassing personal items, gather the dirty clothes, flush the commode, and perform other essential tasks before you start polishing the brass or chrome. Under pressure, people often get distracted by details, like putting everything back where it belongs. You don’t have time for that. In the kitchen, stick the dirty dishes in the dishwasher. Toss the dirty clothes into the laundry room. Collect other odds and ends into baskets and stuff them into a closet or in the garage or attic. After the meeting, you can finish the job. Whether you achieve the results you need or not, quit cleaning before your guests arrive. This will give you a chance to cool down, let the sweat dry and restore a normal pulse and blood pressure. You now can assume the role as the flexible, in-control home-based worker upon whom your clients depend. 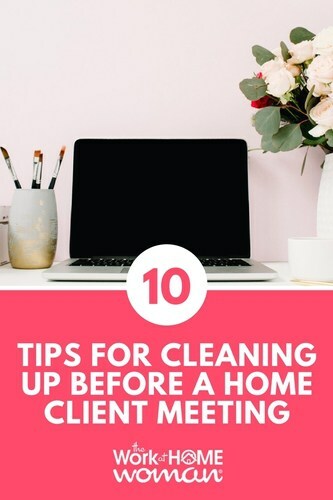 The ten tips for cleaning up before a home client meeting listed here will help you get ready in time. Do you meet clients in your home? If so, what tips do you have for making a good impression? Tim Riley is something of an expert when it comes to meetings, as he's always meeting with people in the hoover bags sector because his main job is reviewing and researching things like Miele vacuum bags. Excellent tips!! This has happened to me on many occasions. YIKES! It’s hard to keep a clean house with a toddler running around behind me pulling everything back out. lol! Check out my link for tips on #6. Works WONDERS! Hi Jenn, I can totally relate – my daughter thinks our coffee table is her toy station. Glad you enjoyed the article, LaTersa. what a great post! I have found myself in the situation a time or two…so glad I must not be the only one!